Improved trails and signage at Lake Raleigh is one of the projects receiving a grant from this year's Sustainability Fund. 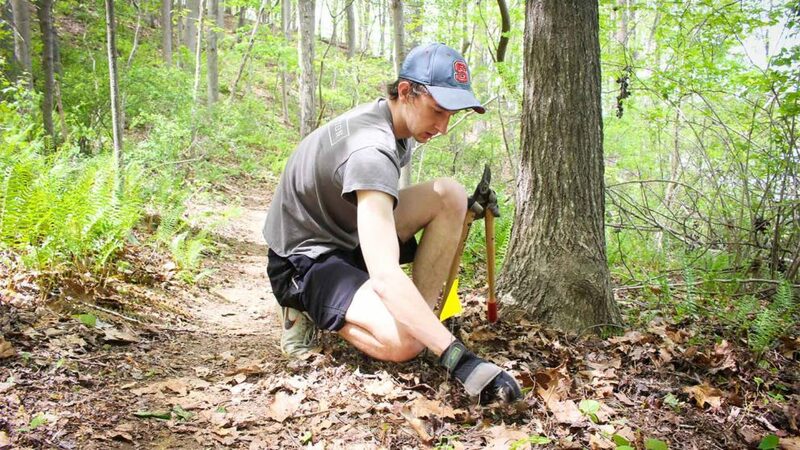 Here, a volunteer maintains a trail during NC State's Earth Day service project at Lake Raleigh. Ten sustainability projects will be implemented on campus over the next year thanks to $120,824 in grants recently awarded by the student-led advisory board of NC State’s Sustainability Fund. “Because of these innovative projects and the Fund, campus is more sustainable and students are more aware of sustainability and the lasting impacts they can initiate during their four years,” said student Liz Wallner, the chair of this year’s Sustainability Fund board. Design assessment for a solar-powered heating system at Bragaw Residence Hall. Installation at the Student Health Center of a window film designed to reduce bird collisions with the building while also providing an undergraduate research opportunity to assess the film’s effectiveness. Installation of water bottle refilling stations at the College of Textiles. Expansion of the Food Recovery Network, a student organization that addresses hunger by working with NC State Dining to recover leftover food from campus dining locations and distribute to local nonprofit organizations. A pilot project that installs timers on Bragaw Residence Hall showers in order to raise student awareness of water use and reduce the building’s water consumption. Improvement of trails and signage at Lake Raleigh to encourage running, biking and other outdoor activities on Centennial Campus. Development of an Energy and Justice Service Trip to educate students about social environmental implications while participating in service projects such as clean up of waterways and after hurricanes. Restoration of the longleaf pine woodland on NC State’s Lake Wheeler Road Biological Field Laboratory involving prescribed burns with assistance from Department of Forestry and Environmental Resources students. Two concerts by NC State and Raleigh Civic Chamber Orchestra to create interdisciplinary conversation about environmental issues and sustainability initiatives. Interactive class assignment that teaches students in Environmental Sciences and other related courses about urban trees. By helping identify and measure campus trees, students will provide vital data to ensuring sustainable tree landscaping on campus. New this fall, the Fund will introduce a fall semester opportunity to apply for grants. In addition to the traditional grant cycle with a February deadline and one year to complete projects, the new cycle will allow student organizations to submit proposals for $1,000 grants that must be utilized within six months. “This timeline encourages student organizations with meetings during the regular academic year to propose ideas and receive funds all within a single academic year,” Wallner said. Updates on the grant cycles, as well as previous projects funded by the Sustainability Fund, are available at go.ncsu.edu/sustainabilityfund. Published in News, Newswire, Uncategorized.